George Johnson and Louis Johnson (aka Thunder Thumbs and Lighting Licks) or Brothers Johnson, originally began their career in Southern California backing live shows of acts like Bobby Womack and The Supremes. They eventually joined Billy Preston's band, and Preston recorded their songs Music in My Life and The Kids and Me before they left his group in 1973. They performed as studio musicians in LA and songwriters for Quincy Jones on his LP Mellow Madness, for which he recorded their compositions Is It Love That We're Missing? and Just a Taste of Me before he went on and produced their hit debut album in 1976 which hit #1 on the R&B charts. Their "Right On Time" album reached number 13 on the Billboard album charts the next year and a followup "Blam!!" came out in August 1978 and reached number 7 on the Billboard 200. 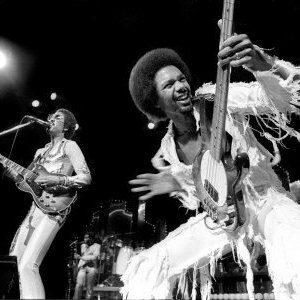 The duo eventually split up in 1982, Louis Johnson played bass on Michael Jackson's Thriller album and George released a solo single on Quincy Jones' Qwest label and contributed guitar to albums including a project done with Steve Lorber and others. They regrouped in the early 2000's and play sporadicaclly together, and occasionally with other funk musicians in amalgamations including Michael Henderson, Adina Howard, Ray Parker Jr., and others.